1) What will be the code for “economics”? 2) What will be the code for “read newspaper daily”? 3) What will be the code for “glory”? 4) Which of the following denotes “b35r” ? 5) What will be the code for “genomics”? Two persons Ram and Ragu started walking towards each other starting point P and Q respectively which are 400 km apart on a straight road Ram travelled for 60km on a road from point P and turn right travelled 30km again turned two consecutive left travelled 50km and 30km respectively reaches main road. Ragu travelled for 100km on a road from point Q and took right turn travelled 40 km and turn left travelled 50km and again turned left travelled 40km. 6) If Ram continued turn right and travelled on 120 km he stopped and Ragu travelled 40 km straight he stopped what is the shortest distance between Ram and Ragu? (a) If Ram continued to turn right and travelled on 120 km and Ragu travelled 40 km straight. 7) What is the distance between Ram and Ragu? Mr. A started walk from his house and walked 30km west, where his friend Mr. B joined him. They together walked for 20km in the same direction. Then Mr. A turned right while Mr. B turned left and travelled 8 km and 5 km respectively. Mr. B turned right to travel 6km followed by 4km to his left to reach his company. Mr. A travelled left and travelled 14 km to reach his company. 8) If Mr. B turns right and walked 2km from his office and reached Tea shop. Then find the shortest distance between Mr. A company and Tea shop? 9) If Mr. A turn left and walked 14km followed by 10km to his left. Mr. A in which direction from his house? Mr. A is in south-west direction from his house. 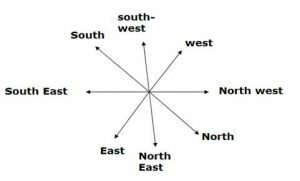 10) If South-East becomes North, North-East becomes West and so on. What will North become? 9th question. He is at north east position with respect to his house. Answer should be option A.